Rarely do we think of animals as craftsmen. The stunning masterpieces our fellow creatures create on a daily basis are usually done out of necessity; birds make nests to keep their eggs safe and bees construct intricate hives to protect their queen and store honey. When we engage and study the methods animals and insects use to create their dwellings, the result is a new field called Animal Architecture. What began as a scientific study, is now filled with artists and designers who look to nature to inform their work. 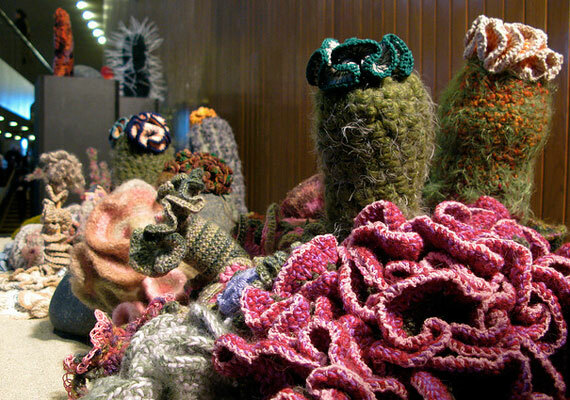 The astonishing inhabitants of the ocean floor are represented in the Hyperbolic Crochet Coral Reef, where the soft, effeminate nature of crochet is combined with the geometric rigidity of coral growth patterns to create a 4,000 square foot reef (pictured in the header image above). Each coral is made through a method called hyperbolic crochet, developed in the late ’90s to explore complex fractals in mathematics. Such a process lends itself to replicating the geometrical innards of coral. ”The basic process for making [the coral] is a simple pattern or algorithm, which on its own produces a mathematically pure shape, but by varying or mutating this algorithm, endless variations and permutations of shape and form can be produced,” writes Christine and Margaret Wertheim, creators of the reef. In its most fulfilling state, animal architecture is a process that can heal and rebuild the homes of animals that have been displaced or destroyed by human activity. In the Red Hook area of New York City’s harbor, the city is focusing on restoring the waterways that have been damaged by a century’s worth of nearby factory pollution. 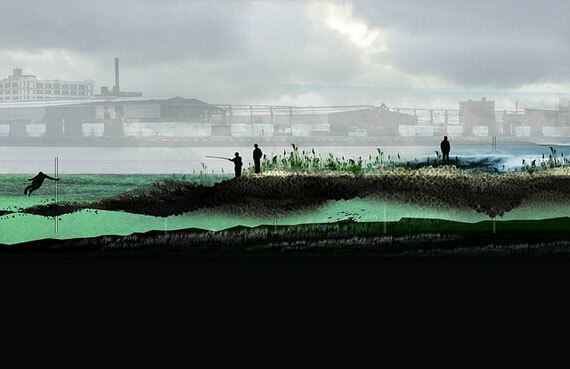 SCAPE, a landscape architecture and urban design firm, proposed Oyster-Tecture, a synthetic reef to be installed in the water, promoting the growth of thousands of oysters, as well as mussels and eelgrass. 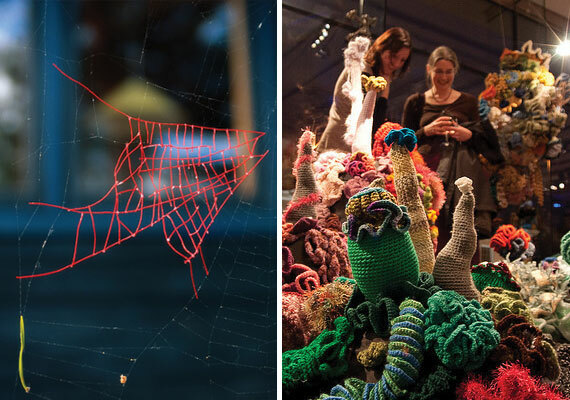 The reef would be constructed out of a fuzzy rope strung in a web-like pattern, encouraging all sorts of creatures and grasses to settle into the webbing. Why focus so much energy on such a tiny creature? Oysters can filter up to 50 gallons of water a day, making them some of the best natural biofilters any body of water could have. They also attract countless new species, like scores of birds, who survive on the shelled morsels for their food supply. Providing a new home for oysters would result in a multi-faceted ecosystem, drawing new life to the area, while naturally cleaning the polluted water. In the case of SCAPE’s oyster project, animal architecture can often become a grandiose practice, where design mockups may look beautiful, but never realized due to budgetary and political limitations. Yet even if Oyster-Tecture is never built, the point of such a project is to encourage a reexamination of our relationship with nature, reminding us to appreciate and learn from other creatures who require the same basic necessities of food and shelter in their lives. “Learning how an organism keeps itself warm or how it recirculates waste is often the easy part; the difficult bit is to actually emulate that strategy with our own technologies,” writes natural science author Janine Benyus in Biophilic Design: The Theory Science and Practice of Bringing Buildings to Life. “With emulation comes humbleness…in this way, biomimicry leads the practitioner into a renewed relationship with the natural world based on respect, awe, even reverence. The act of asking nature’s advice, of valuing nature for its wisdom, bridges the distance that has developed between humans and the rest of nature.” The study of animal architecture isn’t just a process to create better structures; its main goal is to create empathic humans, who realize that we’re only as good as the world we inhabit.